The HiFi Shield 2 provides both stereo RCA connectors and a 3.5mm stereo jack (all gold-plated) to connect to external amplifiers and other audio equipment. Via TI's high-end PCM5242 DAC chip, it supports 16 to 24 bit audio formats with minimal distortion (-93dB) and ideal dynamics (100dB+), plus amazing sampling rates of 192kHz. Now with dedicated S/PDIF interface supporting up to 192kHz/24bit resolution via new Optical (Toslink) output. 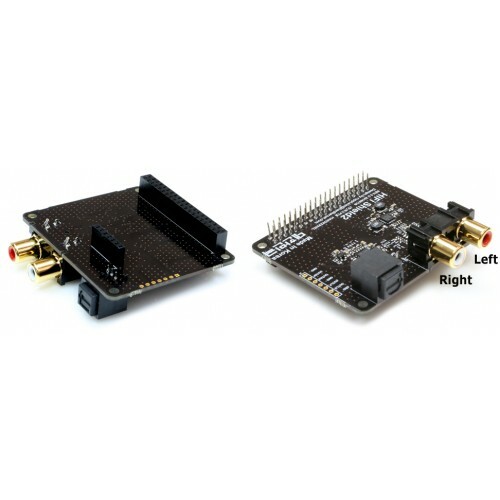 Works with the ODROID-C1+/C2. This is not compatible with the original ODROID-C1. Using the new I2S expansion on the C1+, we save a USB port and allow the user to select their audio playback system of choice, such as Volumio, RuneAudio or XBMC/Kodi for HiFi audio playback. 1. The DAC chip uses a high-end PCM5242 chip from Burr-Brown company (now part of TI) which utilizes the I2S interface. It supports 16 to 24 bit audio formats with minimal distortion (-93dB) and ideal dynamics (100dB+), plus amazing sampling rates of 192kHz. 2. The output ports include gold-plated stereo RCA terminals and a 3.5mm audio jack. 3. An ultra-low noise dropout regulator is coupled with two solid capacitors for the power supply, significantly reducing power supply noise and greatly increasing the signal to noise ratio. 4. The I2S interface allows for direct decoding of the digital input to analog output using master clock synchronization. 5. The PCB surface is comprised of gold-plating on top of 2 oz. of copper, ensuring signal continuity and reducing signal reflection and refraction.